Raintree Woods is a gated subdivision located within the incorporated Texas city of Fair Oaks Ranch. Home sites range from .90 acres to slightly more than 5 acres. Home sizes range from 2,400 sq feet to more than 6,500 sq ft. Consisting of more than 225 up-scale luxury custom homes, the subdivision contains 5 miles of paved roads and 17 streets, all secluded & protected behind security gates staffed with 24 hour guards. Monthly Raintree Woods HOA dues are $85.00. In addition, all owners pay a yearly membership of seventy-five dollars to the larger Fair Oaks Ranch Homeowners' Assoc. All subdivision utilities are underground - with electricity provided by CPS Energy of San Antonio. Water is provided by Fair Oaks Ranch Utilities which is wholly owned and operated by City of Fair Oaks Ranch. Telephone, internet, and television cable are provided by GVTC and Time-Warner. Satellite internet service is also provided by Exede Satellite Internet. Fair Oaks Ranch lies within the boundaries of Bexar County, Kendall County, and Comal County. Raintree Woods lies entirely within Bexar County. 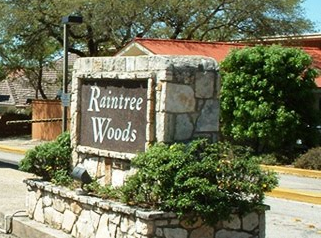 Children living within Raintree Woods attend the following schools: Fair Oaks Ranch Elementary (Bexar County), Boerne Middle School South (Kendall County) and Boerne Champion High School (Kendall County). With an elevation of 1,300 feet above sea level, the land area of Fair Oaks Ranch is about 5.8 Square Miles. Our elevation gives our city year-round average temperatures that run about five-degrees cooler than San Antonio. Fair Oaks Ranch is located at the edge of the beautiful Texas Hill Country. Fair Oaks Ranch is approximately 27 miles from the center of downtown San Antonio (the 7th largest city in the United States with a population of 1.3 million.) The San Antonio Chamber of Commerce reported in 2007 that San Antonio has a cost of living about twenty five-percent lower than the national average. The majority of houses and condos in Fair Oaks Ranch have been built after 1991.